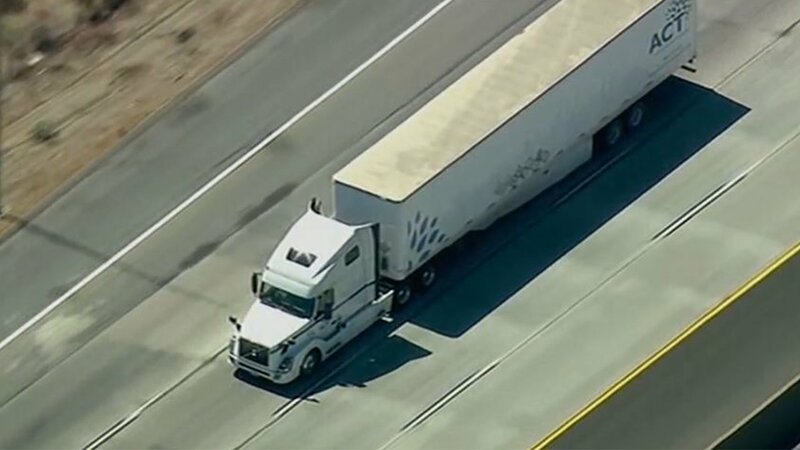 RIVERSIDE, Calif. (WABC) -- A driver in a stolen semi-truck led California Highway Patrol officers on a high-speed chase for hours on Tuesday before surrendering. The incident began at around 10:30 a.m. PST in Apple Valley, where the driver failed to yield, according to San Bernardino County sheriff's officials. The driver told police that he was not armed and that he did not want to go back to jail. The suspect also drove onto the eastbound 60 Freeway, speeding through Gilman Springs and Beaumont. The driver surrendered shortly after 1:30 p.m. PST. The truck belonged to "ACT Enviro," a company that transports hazardous material. A spokesman for the company told ABC News that based on the manifest of the vehicle there are no explosives, no radio-logical hazard, no biological hazard, and a limited flammability risk. The truck originated in Sunnyvale California and was enroute to US Ecology in Nevada, he said. It was reported stolen at 6:30 a.m. and CHP was contacted immediately. The spokesman said "the contents are pretty mundane." The thief deactivated the GPS tracking mechanism in the truck, but the truck has a secondary system that they were able to track, he said.